“My first blog of the new season is coming to you from Brands Hatch where we are preparing for the start of the Formula Renault BARC championship this weekend. We’ve joined a new team, Welch Motor Sport which means I have a teammate this year, an experienced driver called Kourosh Khani from Iran. He’s a really nice bloke and I’m looking forward to working alongside him, although I’ll also be looking to go quicker than him! 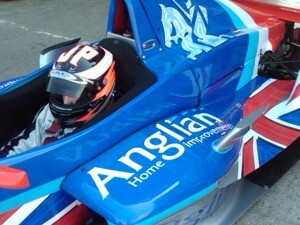 The car has a totally new look this season, with the Union Jack included in the design. I’ve got to say a massive thanks to the team at Anglian Home Improvements who helped chose the design – everyone says how good it looks on the track. We’ve even had other teams come into the garage to tell us how good it looks, so that’s great. We’ve done some pre-season testing at Snetterton, Silverstone and Brands Hatch. The car is going well and I’m really confident to building on what we learned last year. As I say it all gets underway at Brands this weekend with qualifying on Saturday and two races on Sunday. Things went well in practice on Friday. We did six sessions during the day and managed to go more than a second quicker than last year which the team are really happy with. The other rounds this year are at Silverstone, Croft, Rockingham, Thruxton and Snetterton at the end of July, which I’m really looking forward to because it’s close to home. Thanks again to everyone for your support, it’s really appreciated. I’ll keep you posted with how it goes this weekend and the rest of the season”. Please keep an eye out on the Blog over the weekend for more updates from Brands Hatch.